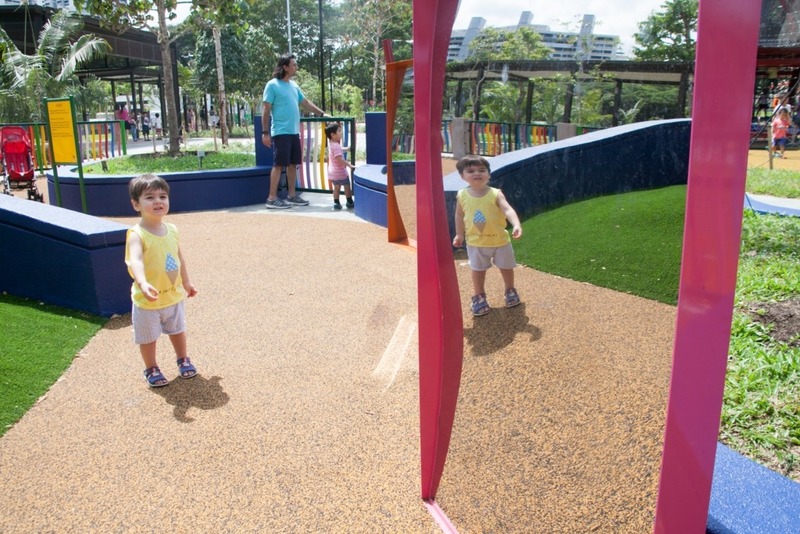 When I was given the chance to review the new outdoor playground at Marine Cove East Coast Park, I jumped at the chance. 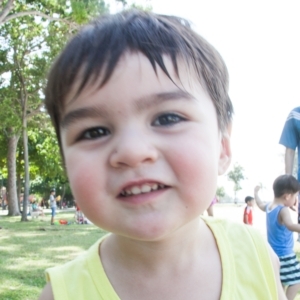 After all, now that I have a little toddler of my own, it was the perfect opportunity to make some new memories of my once-favourite hangout with Elliott by my side. 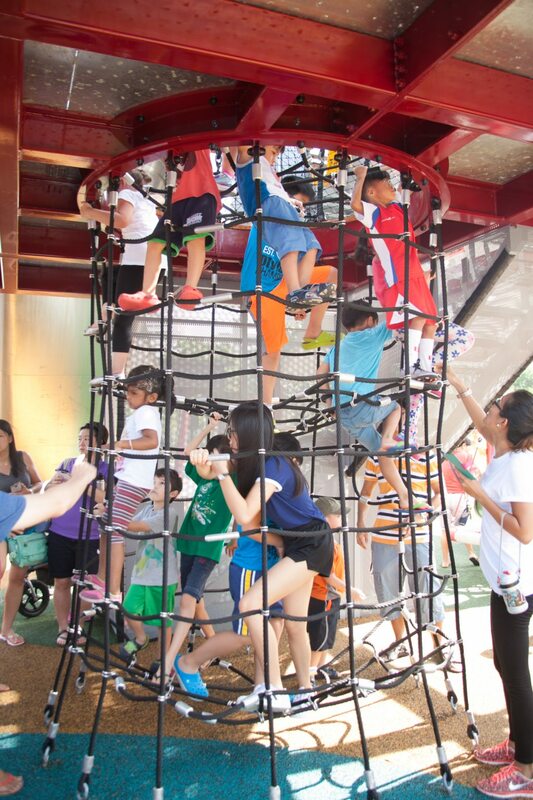 It didn’t hurt that there was a massive free playground as well. 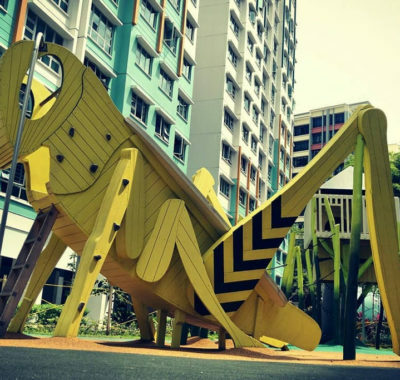 If, like me, you grew up in Singapore before the noughties came along, chances are you’d have fond memories of Marine Cove as a kid, better known as East Coast Recreation Centre back in the day. 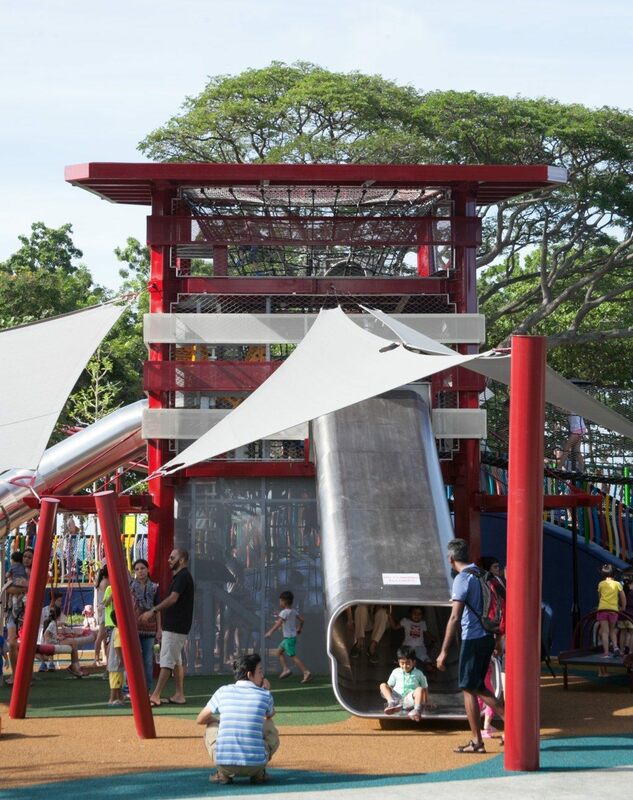 From a bowling alley to an amusement park − not forgetting a hive of dining options that spoilt us silly − it gave us plenty of reasons to visit East Coast Park. Sadly, it was demolished in 2012, leaving a trail of broken hearts in its place. 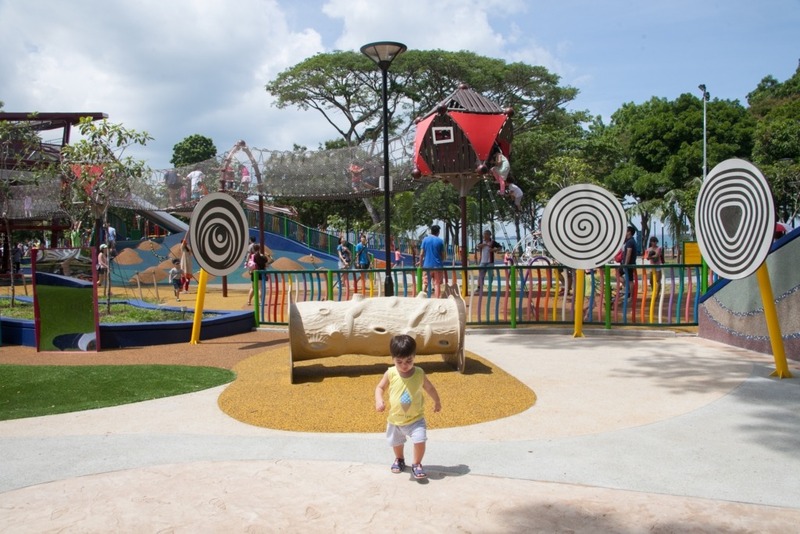 Four years on, Marine Cove has finally reopened its doors to much fanfare, with promises of family-friendly amenities, ample sea views and most importantly, a brand new 3,500 sq m children’s playground to boot! 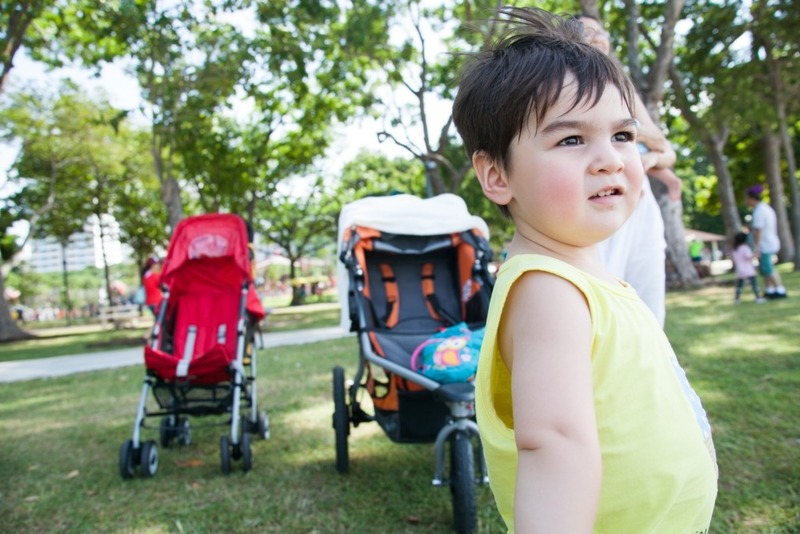 Together with Elliott’s older cousins Ruishuang, a bumbling little princess all of five years old, and Reginald, who recently turned two, we set off for Marine Cove East Coast Park on a sunny Saturday morning. We arrived at 9am when the sun was out in full force, leaving little to be desired in the unshaded portions of the playground. Some of the equipment were even too hot to be played on. While the trees and canopies provided some form of shade, it was no match for the morning sun. In hindsight, late afternoon or early evening would have been a better time to drop by. We recommend that you drink plenty of water, slap on the sunscreen and bring along a portable fan. 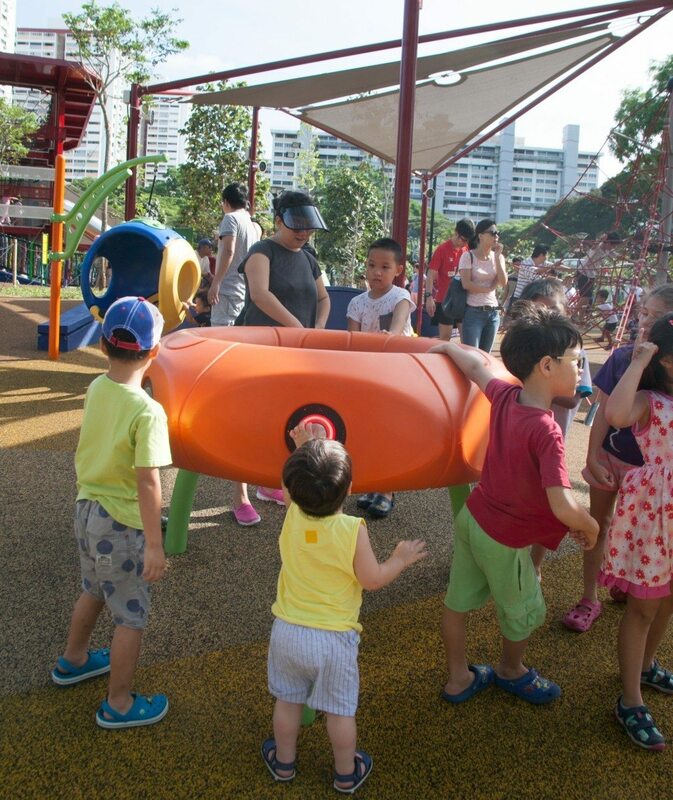 Nevertheless, the kids weren’t going to let a little heat dampen their fun, not when there was an endless array of colourful play structures waiting for them to jump on. They were determined to explore every last inch of this barrel of fun Marine Cove East Coast Park. 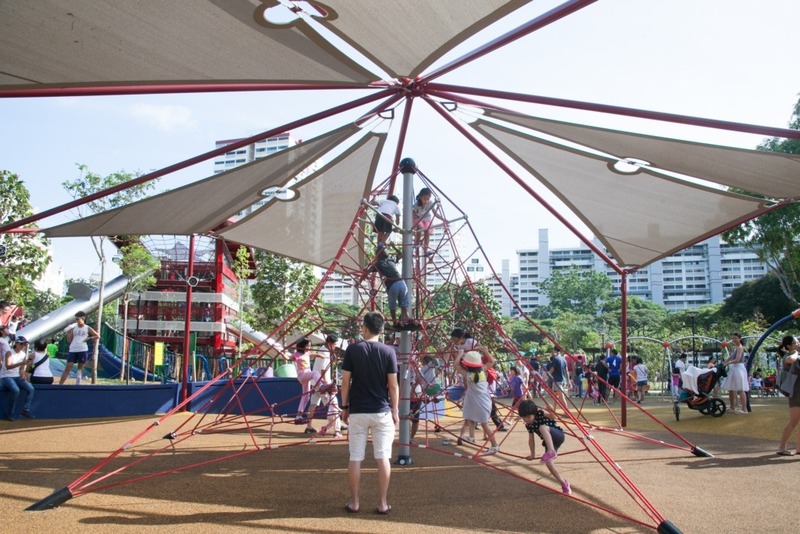 The playground at Marine Cove East Coast Park is one of the biggest I’ve seen, spanning across a 3,500 sq m expanse that could easily fit over 100 children at once. 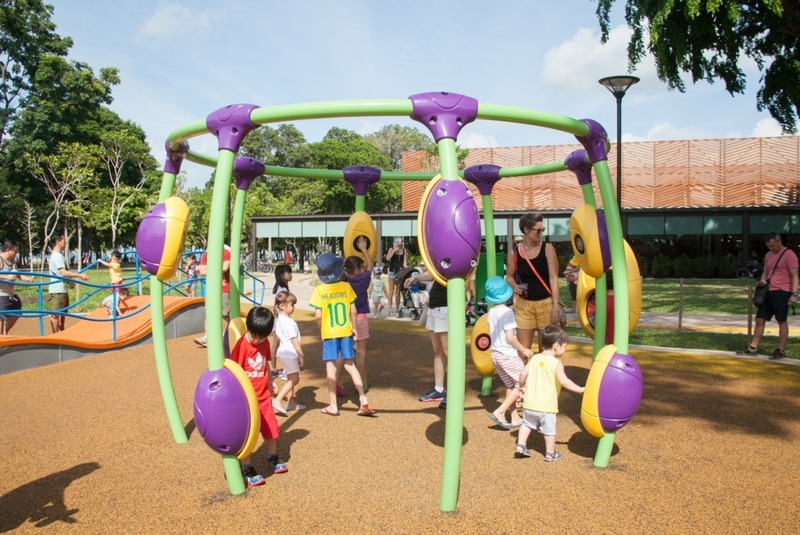 Built for kids of ages up to 12, the space is carved into different sections, each fitted with a diverse selection of play equipment suited for various age groups. 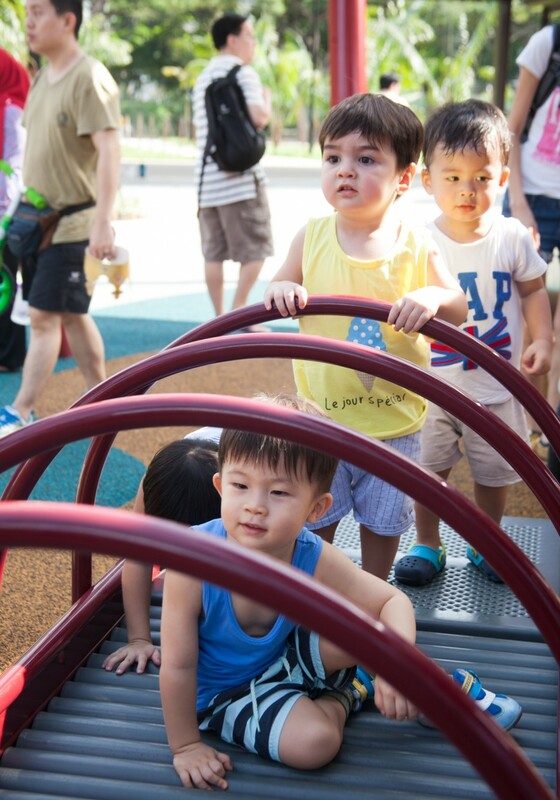 At the centre of the playground sits its key attraction, a three-storey tower modelled after a lighthouse. 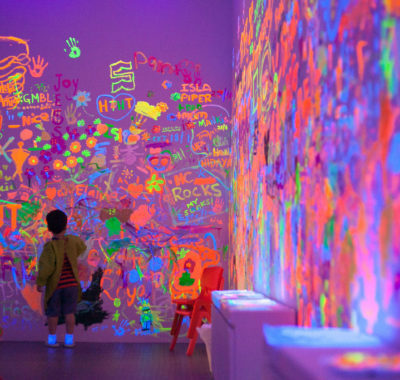 In a bright shade of red designed to catch every child’s eye, it features many play elements. 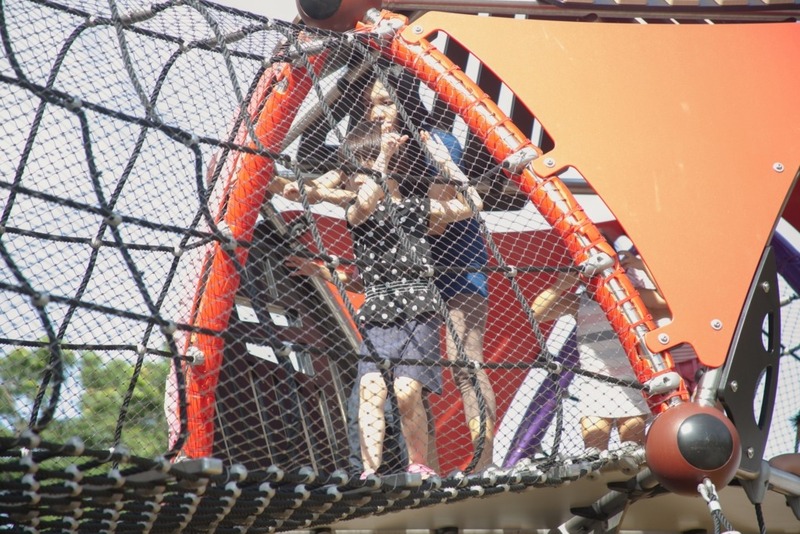 These include a funnel net in the middle for the ‘climbers’ to make their way to the top with, three slides of different levels and widths to send the kids zipping back down, and a wobbly rope bridge for the fun-sized daredevils. 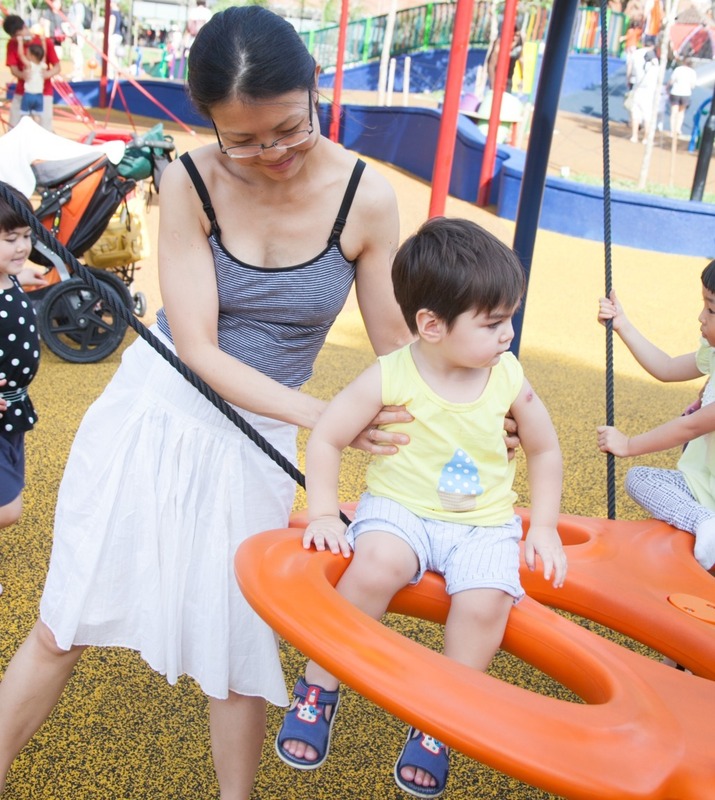 As it’s intended for older kids aged five to 12, I decided to spare myself the heart attacks and steer the toddlers (Elliott and Reginald) to the netted swings below the tower instead, while Ruishuang kept busy on the slides. There’s plenty of fun to be had for the younger critters as well. 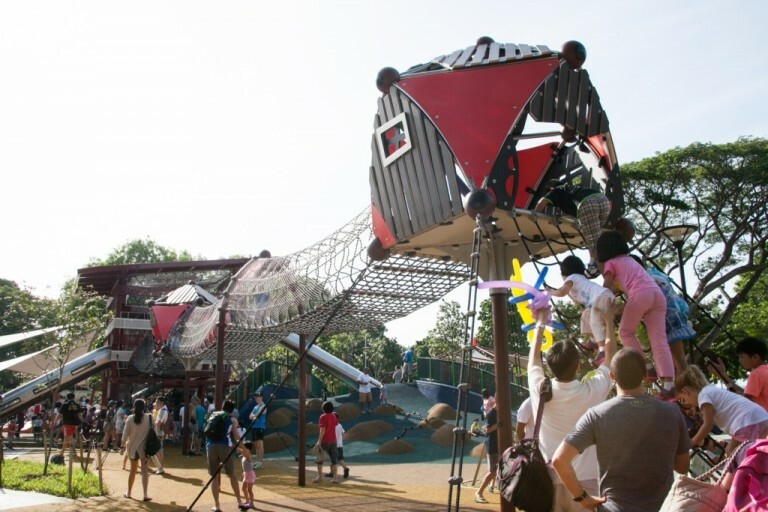 Kids aged two to five years old can run freely in a toddler play area, complete with easier climbing structures and shorter slides. There were also an array of talking tubes, fun mirrors, spinning wheels and a little grass maze to keep them learning through play. 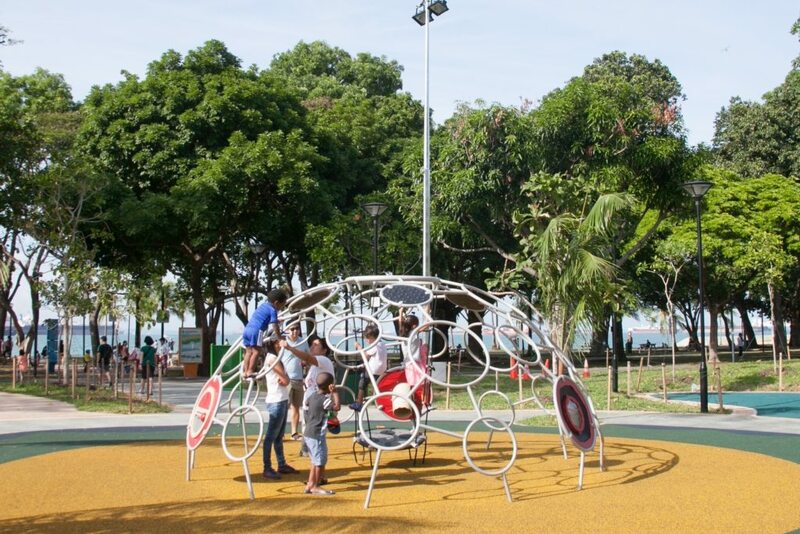 However, the direct sunlight and lack of shade in this area make it almost impossible to play when the sun’s at its peak. 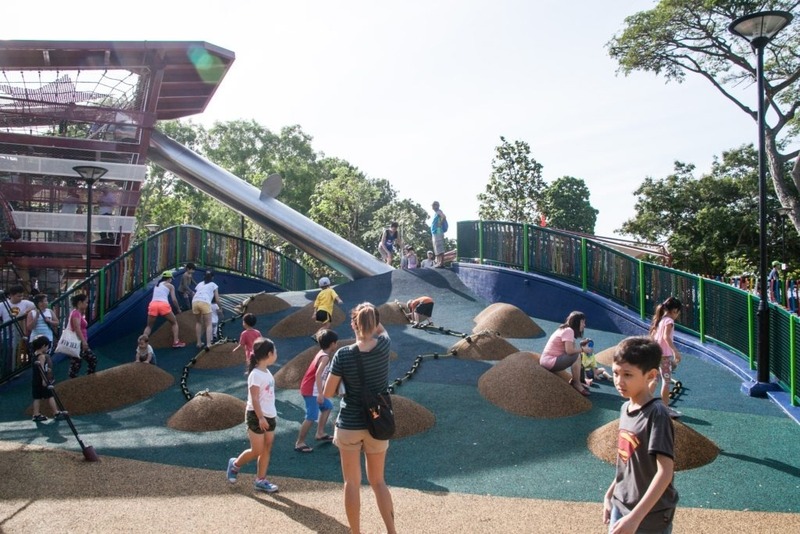 Otherwise, you can also find the usual trimmings scattered across the rest of the playground, from see-saws to swings and climbing walls to monkey bars. 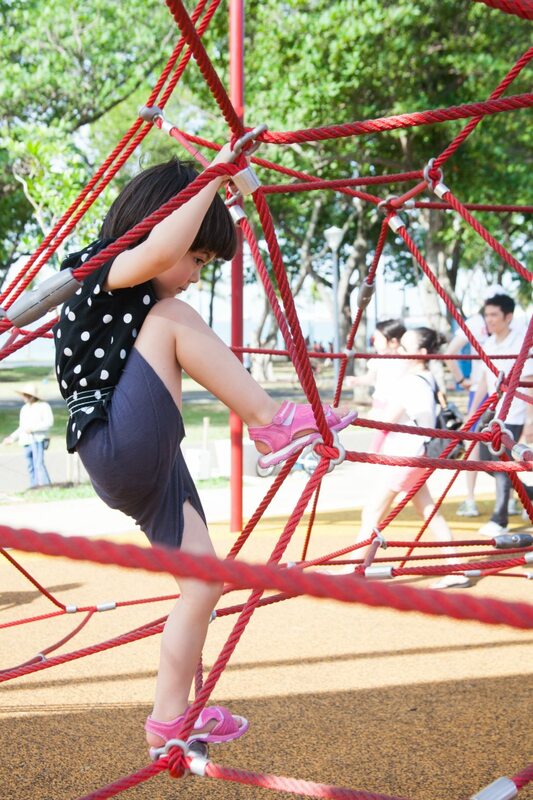 There was also a netted climbing structure resembling a spider web that Ruishuang turned out to be surprisingly good at. Meanwhile, Elliott especially loved going round and round on the merry-go-round, until I had to help him off when a couple of older kids decided to hop on and turn up the speed a couple of notches. Another interesting highlight of the playground is the Neos Ring, a sensory play panel with buttons that light up randomly to different sirens and sounds. The kids have to keep hitting the buttons for the lights to go off; the kid with the highest number of hits wins. 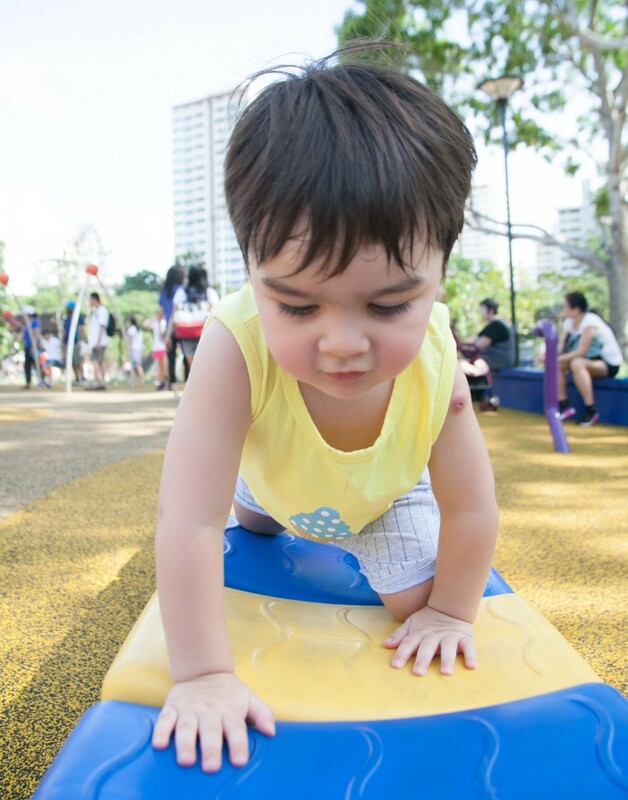 This creates a sense of discovery and helps develop motor skills, hand-eye coordination, rhythm and movement. There’s even a digital scoreboard on the side to help keep score. High-tech play − how times have changed! 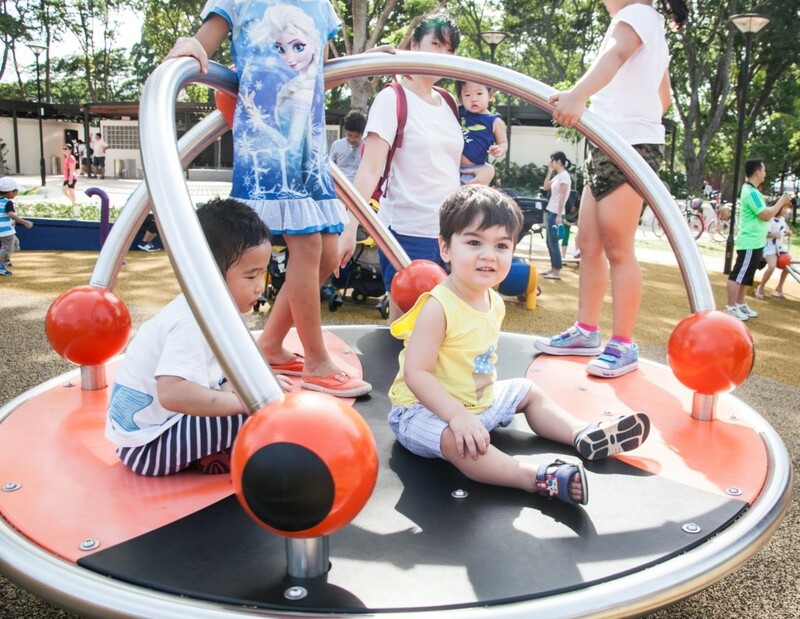 The Neos Ring is just one of the many pieces of inclusive play equipment that encourage children of different abilities to play together. 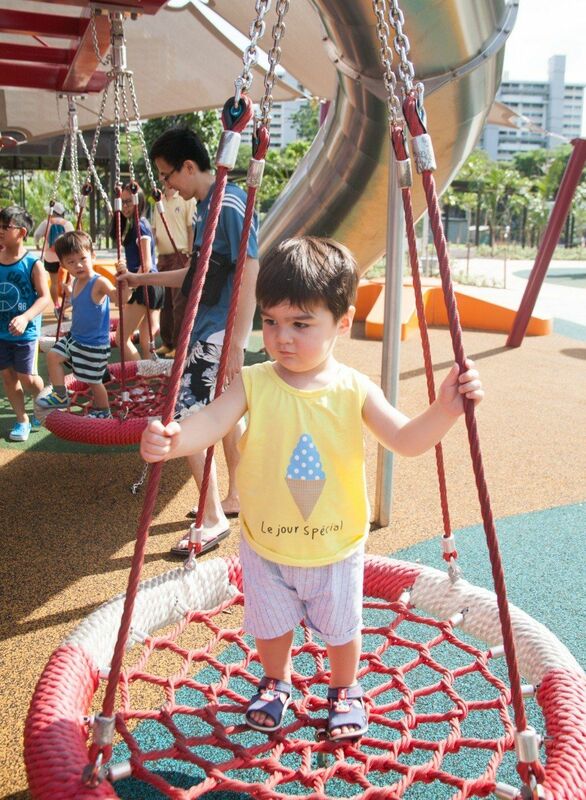 These run the gamut from loads of interactive games and musical instruments to accessible swings strapped with safety harnesses. 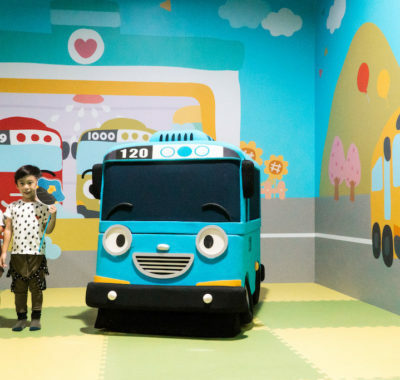 There are even ‘timeout’ pods in which kids with special needs − or are simply shy − can catch a brief respite from large crowds when things get too overwhelming. 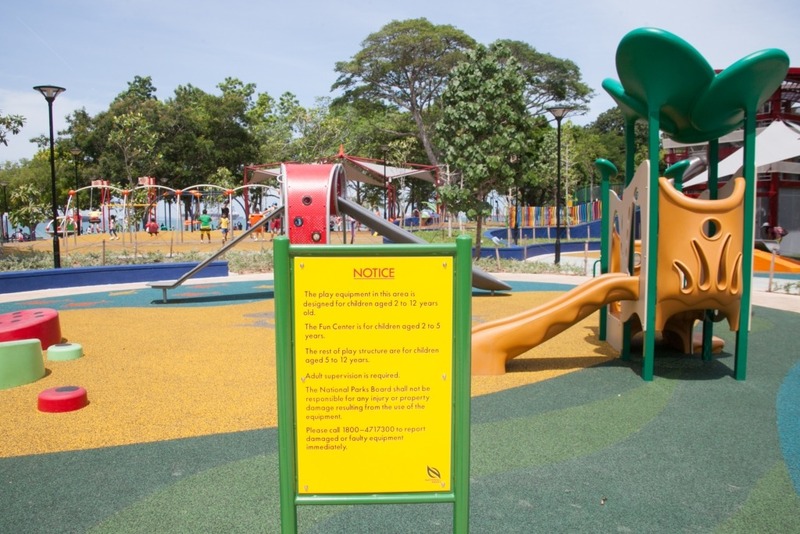 Plus plenty of large, open spaces with flat surfaces that not only allow kids to run freely, but also make it possible for wheelchair-bound kids to join in the fun. 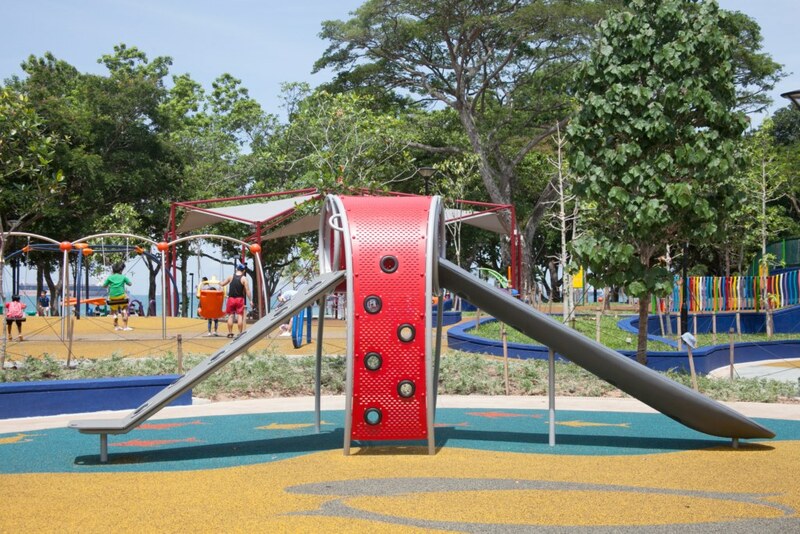 Its accessibility features are definitely what makes the Marine Cove East Coast Park playground stand out from conventional ones. Famished, we ended our day with a makeshift picnic of packed lunches while enjoying a breezy sea view. 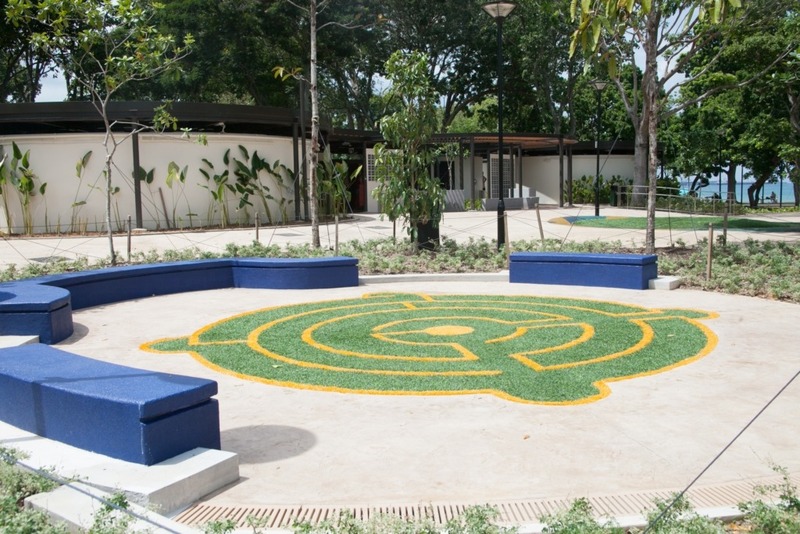 There are also a variety of dining options available on-site, including the trademark golden arches of McDonald’s making a comeback with gourmet choices such as a salad bar for the health-conscious, a dessert bar and a selection of premium burgers. 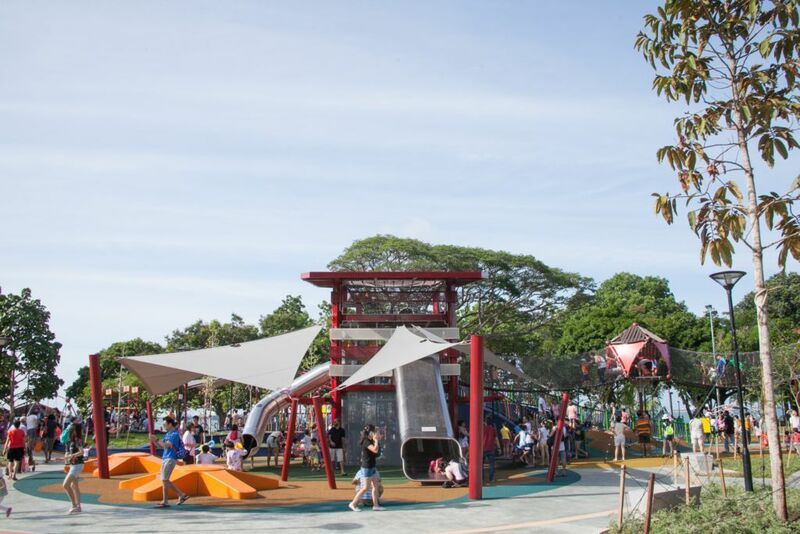 It’s hard not to love East Coast Park, whether you’re a kid or an adult, especially now with the addition of the free mega playground at spanning oodles of space right by the beachfront, offering kids of all ages and abilities endless amounts of outdoor fun. 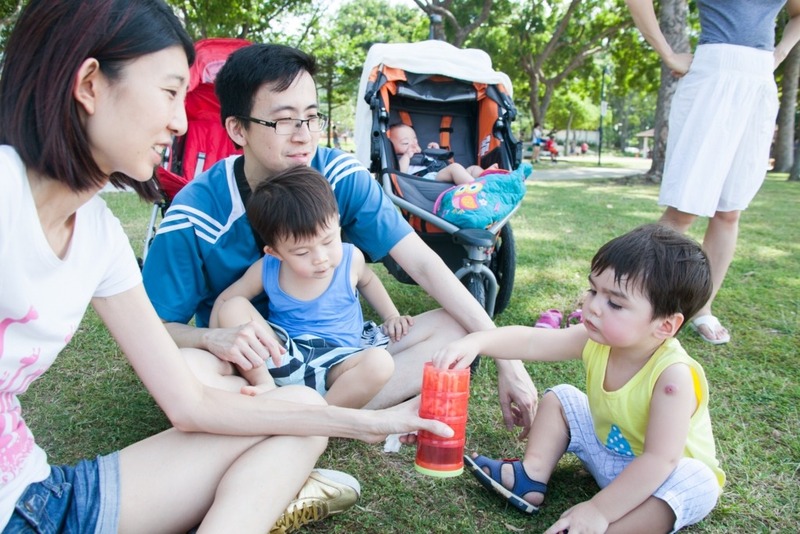 It was crazy hot and crowded, but a fun day out at Marine Cove East Coast Park nevertheless. 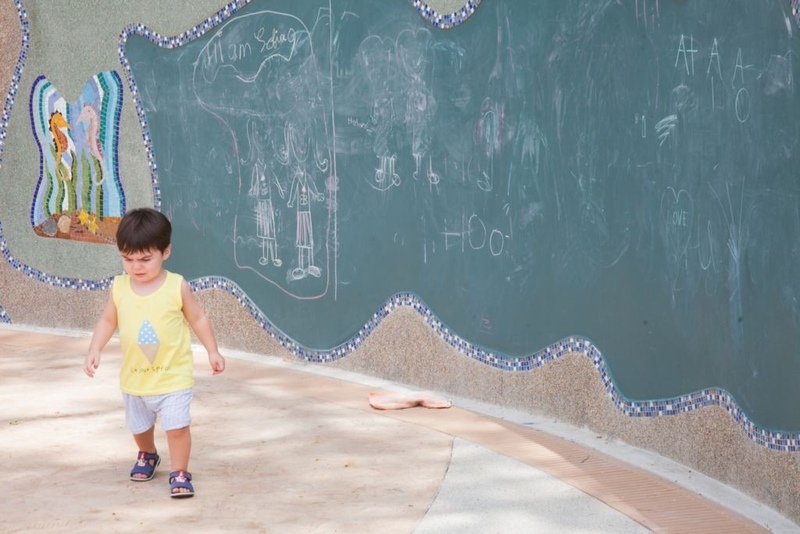 He enjoyed exploring every last inch of the playground with his cousins, and even made some new friends along the way. The heat, however, left him exhausted quickly, flushed cheeks and all. We’ll definitely be back with plenty of sunscreen! 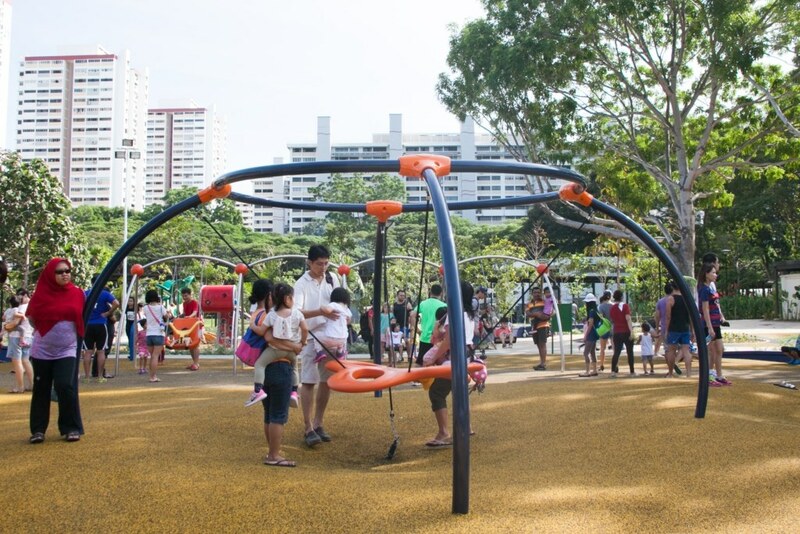 On foot − 5-minute walk from the underpass linking Marine Terrace to car park C3. 10 Amazing Themed Dessert Tables for Your Kids’ Birthday Parties!